Choosing good gaming laptop nowadays can be hard and exhausting. There are a ton of great laptops on the market right now, and they all have similar specifications. That's why I am here today, to help you choose the best gaming laptop under $1000 for you. 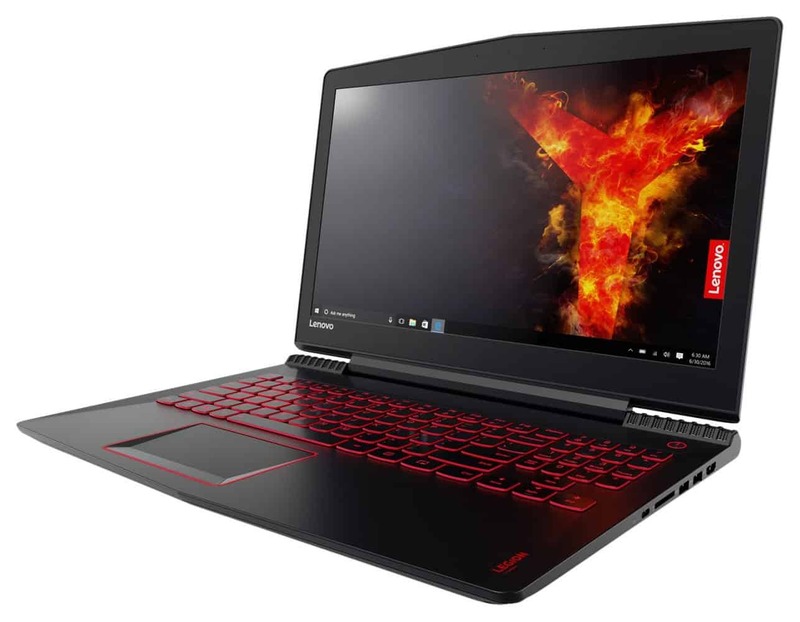 I listed 5 gaming laptops at this price range, and I also talked about what is my favorite one and why. This will be the long text, but it is definitely worth the time. However, if you don't have enough time right now, you can skip to the end and see the best one. Enjoy! Lenovo is a very good brand in this field and they don't make low-quality products. Y520 is (one of) the best gaming laptop under $500 and I think it is amazing. The screen is decent and bright and the components are top notch. With this beast, you can rock any game at 1080p. I love red and black color combination, especially if the thing is made for gaming. That's why I love the design of Y520 so much. I think it is great. Lights under the buttons aren't very useful, but they look so great and I personally love to have them on my gaming equipment. If you are reading this article, I think that you have $1000 and you are ready to spend them on a good gaming laptop. This beast costs less so you will be able to get good headphones or mouse with the money that left. I think it is worth the money and that's why I recommend it here. For the price less than $1000, I am impressed by the overall quality of this laptop. Let’s be honest for the second, in today’s world, gaming laptops with this price point, are on the mid-range side. They are getting more and more expensive, so don’t expect to get all the best with something under $1000. But, I need to say that this laptop is very good, and I really love it. It is made of plastic but it doesn’t look cheap. Also, it doesn’t look like a gaming laptop, like competitors. It has very simple and clean look. One downside that I have is that plastic on the top of the laptop is a magnet for fingerprints and little scratches, so be careful with it if you want to keep your Y520 fresh and new. It is also very light, weighing just around 5.3 lbs (2.4 kg). We can find a lot of ports on this laptop. There is one USB Type – C, two USB 3.0, one USB 2.0, one HDMI port, audio and microphone jack, RJ45 LAN port, and last but not least, 4 – in – 1 card reader. At the front, we see 15.6 inch 1080p display, so it isn’t big and bulky also. It has a thick bezel, but it is great to work on from the outside where the sun is shining. But because of that, the laptop has bad viewing angles. The contrast isn’t the best, also. That shouldn’t be a big problem for gamers, but it can be for some graphic designers or video editors. But, Lenovo made the really great keyboard, with nice red light under keys for night use. I can easily say, that keyboard on this laptop is the best in this list. It is also full size, which is a big plus. The trackpad is also nice, but buttons are a little hard to press, but who play games with trackpad?! For Skype or something like that, you have 720p camera. It isn’t the best, but it is fair and okay for laptops. Speakers are excellent, best in this category. If you open Y520, you will be able to replace only SSD, so there is no upgradeability. Fans are really close to CPU and GPU, so you won’t have problems with temperatures, even during hard gaming. Fan noise is noticeable when the sound is off, but you won’t be able to hear it if you wear headphones, or play the game with sound on. SSD is really fast, and I really mean it! This laptop will turn on in just 6 seconds, which is absolutely incredible. And the last thing is battery. You can use this laptop for 5 hours, of course, while surfing. While gaming, you will be okay for like 2 hours maximum. This little machine is powered by Intel I5 7300HQ, which is some standard for gaming laptops with this price point. This model is coming with GTX 1050TI, which is also good, and you will be able to see some results from gaming later. It also comes with 8 GB of RAM, running at 2400MHz. That will be enough to run multiple things at the same time, like gaming and streaming. As I said above, Y520 has a 1920x1080p screen, which isn’t the best in this category. It is okay, but not very good. I would really prefer better screen for this price. If you however have a bigger budget than this, you can check out our guide on buying the best gaming laptop under $1500. 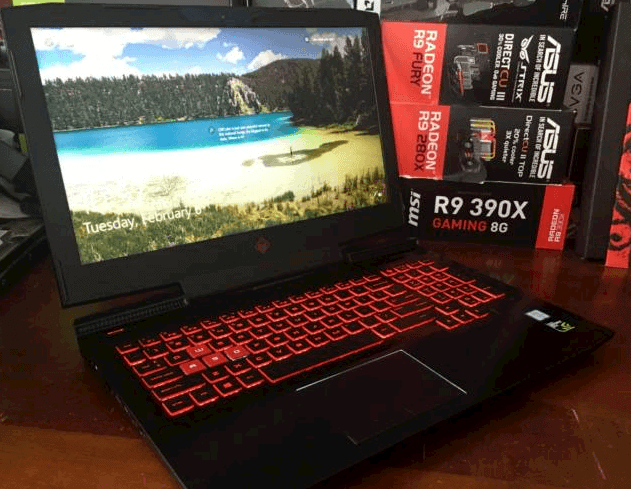 For this price, you are getting a really good laptop for gaming and playing new games. You will be able to pull around 55 fps playing GTA V on high settings. If you are more into Overwatch, don’t worry, because it will run on ultra with like 70 – 80 fps. But if you want to play Battlefield 1, you will be able to run it on high with around 50 fps, which isn’t bad at all for this price. Acer Aspire VX-15 is one of the picks that I would highly consider while searching for a new gaming machine. It is very good, screen and keyboard are okay and components are also well-made. GTX 1050 Ti will make be more than enough for 1080p gaming at highest settings. 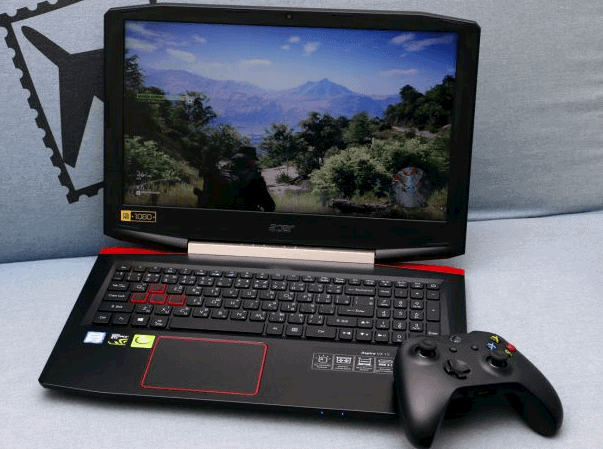 Acer knows how to make good looking gaming laptop without adding tons of little details. It is all plastic but build quality is pretty good. It is very strong so you won't have problems with that. The one thing that I love the most is brushed aluminum back panel with two red stripes. It looks amazing! VX-15 is on the edge of our budget, but it is definitely worth the money. For $1000, you are getting a good and portable gaming machine that will run all modern titles on very high settings. This is more than good for gamers and you can also use for a lot of different jobs. I recommend it! Another one from Acer, this time Aspire VX-15. The price starts at around $800, but the one that we will show you today is around $1000, because we are looking for the ‘best gaming laptop under $1000’ not under $800. The design is pretty nice, with pure gaming look. I really love this design, because you immediately know that it is gaming laptop. Built quality is decent, and laptop is made from plastic. The top panel has red accents with brushed aluminum look, which is perfect if you ask me. The whole look of VX 15 is similar to Predator series. The laptop is weighing around 5.5 lbs (2.5 kg) which is okay for a gaming laptop because you are not buying 13 inch MacBook air. If you are wondering about ports, don’t worry. This Acer is coming with three USB-A, one USB type C, HDMI port, SD card slot and audio jacks. At the front of laptop, we see nice 15.6 inch display. It is 1920 x 1080p IPS screen which isn’t the best, but it is good for gamers. Viewing angles aren’t the best, but you won’t have problems with it if you are gamer. Acer brings full size keyboard with red backlit, which is perfect because whole laptop has black and red design. The keyboard is pretty nice, but the touchpad is better than average. It looks and feels great. The laptop is equipped with 720p camera. It is okay for video calls, but don’t expect DSLR camera. It is okay for gaming laptop. Speakers are good and loud, and you won’t hear fan noise if you turn speakers on. If we open laptop, we can find two memory slots if you want to upgrade RAM. There is space for 2.5 inch drive, which is fantastic. Shame is that there isn’t a lot of laptops with this kind of upgradeability. As I said above, fans aren’t loud. They are okay, and laptop’s keyboard won’t get hot. SSD is fast and good, like every other one. And the last but not least, battery. It is pretty good, but not the best. It will be okay for a couple of hours, but don’t expect anything better than that. This laptop is on mid-range side, and that is the reason why everything can’t be fantastic. But, I would prefer better GPU than better battery. Acer made a very good laptop here. For this money, they configured pretty great setup for all gamers out there. You are getting Intel I7 7700HQ processor, which is great for gaming and for hard work on PC. But you are buying gaming PC, so the most important part is GPU. Aspire VX 15 is powered by 4 GB Nvidia GeForce GTX 1050 Ti. It will be enough to support every game on high settings for a couple of years. Ti model is about 20 – 25% better than standard 1050 one. You are also getting 16 GB of RAM, and it is plenty for multitasking like streaming and playing. 8 GB of RAM is minimum in 2019, but 16 will be more than enough for everything. As I said above, the screen is not the best, but pretty decent for gamers. For this price, you will love this laptop! With 1050 Ti, you can easily break 100 FPS on light games on high. Average games will run on 60 FPS which is absolutely more than enough. But, for some really heavy games, you will need to drop your settings to medium, but that is the rear case. Another laptop from Acer on this list, and this time, even better than previous one. The main reason why Helios 300 can be the best gaming laptop under $1000 is because it has GTX 1060, and with this GPU you will be able to do whatever you want. Gaming with this is a pleasure. I love the design of Helios 300. It has aggressive gaming look with nice little details all over the laptop. I love the look of the keyboard, especially WASD buttons. The back panel is also looking great, with Predator logo and two big red stripes. And all of that, with combined with brushed aluminum. Yes, it costs $50-$100 more than we want, and that is the only downside it has. But if you have enough money or you can save a little more, I highly recommend that because it is worth every penny. Trust me, you should spend a little more money on Helios 300 and be safe for a couple of years. I know what are your thoughts right now, ‘This isn’t under $1000’ or ‘Is this guy stupid’ and so on… Well, this is a little bit more than $1000, but nothing much. And trust me, there is the reason for this price. And it is the GPU, most important part of a gaming laptop. It rocks GTX 1060, and all the other laptops on the lists come with 1050 or 1050 Ti. But, we will talk more about specs in next part of this review. The design is very aggressive, with ‘gaming’ look. On the back panel, you see big Predator logo with two red stripes. The whole laptop is made of metal and plastic. 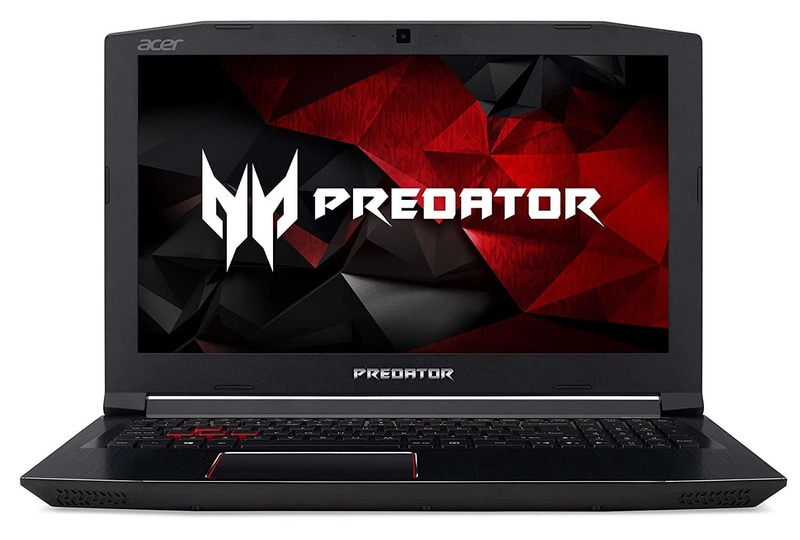 The design of this laptop is a mix of more expensive ones in Predator series. It is a little bit heavier than others on this list, weighing around 6 lbs (2.7 kg). It has a lot of ports on both sides. You are getting: one USB 3.0, two USB 2.0, audio jacks, internet jack, HDMI port, SD card slot and one USB type – C slot. You can buy this laptop in two sizes of screens, 15.6 and 17 inches. The bigger one is more expensive, and if you ask me, it is too big. It is 1920 x 1080p IPS display which is better than any on this list. Still, it isn’t the best for designers. You are also getting a full-size keyboard, with red backlit, which is normal for Predator series. It has very nice rubber feel. The trackpad is not the smoothest, but it is okay. Still, I prefer to use a mouse when playing on a laptop. Imagine playing Overwatch on the trackpad. As always, the webcam is 720p, with decent quality for video calls or Skype. There are two speakers on the bottom of the laptop, with good sound, but there isn’t any base. But, they are still good for gaming or watching movies. Acer made putting new SSD or RAM to laptop very easy, with no effort, which is great for all the gamers out there that don't know much about building laptops or PC. Fans are great, and there isn’t a chance that laptop will get too hot, and that is a big plus for Acer. And last for this review, battery. It is okay, but nothing special. Like other laptops on this list, you can play games for about an hour or two, or watch movies and be on social media for about four hours. Let’s see what components come with the best laptop on this list. For CPU, Acer used Intel I7 7700HQ quad-core 2.80 GHz. And now, the king, Nvidia GeForce GTX 1060 with 6 GB Dedicated Memory. That is why you should pay a little bit more. This GPU is amazing. You will be able to run all the games on ultra for years with absolutely no problem. You are also getting 16 GB of RAM, which is amazing for multitasking. As I said above, the screen is also better than any on this list. 15.6 Full HD screen. And last but not least, storage. This laptop comes with 256 GB SSD, but you can always add one more. And yes, we can call this the winner. Acer Predator Helios 300 is the best gaming laptop under $1000. Maybe a little bit over that. Man, this machine has 1060. It can handle all the games out there on ultra. So don’t worry about playing Overwatch or Battlefield 1, because you will be able to pull more than enough FPS in high settings. And it will stay like that for a couple of years. 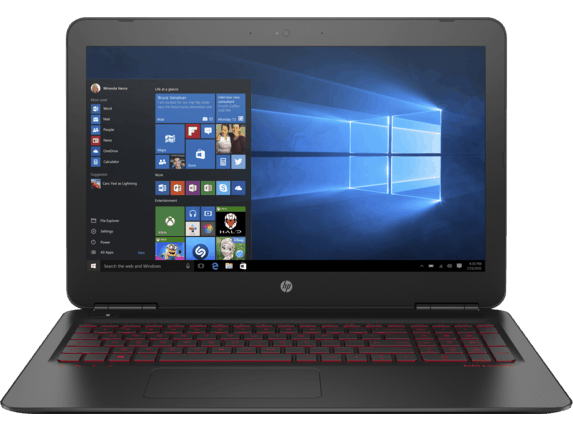 HP Omen 15 is a great laptop for everyone that wants safe gaming choice that will run all the titles at high settings with decent FPS. And it truly is, GTX 1050 Ti and i7-7700HQ are great components that will be enough for 1080p gaming. However, I think there are better choices than this laptop. Design of this laptop is decent if you ask me. It looks like a normal laptop with a little gaming details. I would love to see something better than this if I am getting an expensive gaming laptop. However, if you love minimalism and you don't want your laptop to have aggressive gaming look, maybe this is for you! Price is quite fair, and you can't expect anything more than this. As I said, you are getting i7 CPU with GTX 1050 Ti. You will be able to run all the titles with a nice amount of FPS. At the end of the day, only performances are important, and you should pay your attention to them, not design. This is the only laptop from HP on this list. This isn’t the new laptop, it is just the update from the last year. So it looks the same as old one, but components are completely new which is awesome. Entire laptop is black except red logo on the top. It doesn’t glow, but it is nice. The top has carbon fiber feeling, like one on XPS series from Dell. It isn’t looking like other gaming laptops, it has very simple and great looking design. Omen 15 isn’t heavy, weighing only 5.2 lbs (2.4 kg). There is a decent amount of ports, three USB 3.0 ports, audio port, HDMI, and LAN ports, and of course, SD card slot. The shame is that there isn’t any USB type – C port. The laptop comes with a 15.6-inch screen, which is pretty good for this list. The laptop has big bezels, also contrast and viewing angles are nice. It isn’t the best for editors and designers, but for gamers it is fantastic. Omen 15 comes with a full-size keyboard with red backlit. There is only one level for backlit, which isn’t the big deal. Keyboard feels great, and it is great for gamers. The trackpad is okay, nothing special. I would prefer better trackpad. It is made of plastic, but it is okay for scrolling on Facebook or something like that. But, for gaming, you will need to buy the mouse. There is HD camera on the top, which is okay for video calls. Now, one downside. Audio isn’t the best. It is okay, but nothing more. It can be loud, but the quality of sound is not the greatest. I think it is okay for movies or listening to music. If you want to upgrade something on Omen 15, you can. There is the removable 1TB hard drive. Also, other drive is replaceable. You can even upgrade RAM if you need it more, but the maximum is 32 GB. Fans are also great, so don’t worry about the heat of laptop, because it won’t get hot. Now, let’s talk about battery. It is great for a gaming laptop. It can hold for 6 hours if you browse the web or watch movies. But if you want to play games, don’t expect more than 3 hours, which is reasonable. Now, let’s see some specs. Omen 15 is coming with Intel core I7 – 7700HQ quad-core processor. You are also getting Nvidia GTX 1050 Ti, and that is great. As I said earlier, it is 20-25% better than normal 1050 one. It has 12 GB of RAM, which is more than enough for everything. The screen is, as I said, pretty good. It isn’t as good as Helios 300’s one, but it is better than most on this list. It is 15.6 inch IPS display, great for gamers. And last but not least, it is coming with 1TB hard drive, which is great for storage, but it isn’t the fastest. That is why you also get SSD, which is really fast. You can play every game on high/ultra. Overwatch will run on more than 120 FPS. You can play Diablo on 60 FPS on high. If you want to play Battlefield 1 on high, this laptop will get you more than 60 FPS. So don’t worry about playing games, because 1050 Ti will do it easy. Can it be the best gaming laptop under $1000? You can find out that on the bottom of the article. This is pretty new and updated version of an old 7567. That is nice from Dell and I love updated GTX 1050 Ti version because it is better by around 20% than standard one. However, display isn't the best and it has old TN version. Another downside is Intel Core i5 instead of i7 but it still performs nice at 1080p gaming, so don't worry too much. I don't know why I love this design so much. Maybe because it has that famous 'gaming' look, but it isn't too aggressive. It is just in the middle which is the best in this case. Build quality is also very good and all parts are from high quality plastic. I don't know why people think plastic is bad because it is really sturdy and light. Just under the budget, this laptop is worth every dollar. I think it is well-made with nice quality components, but it also has good components. If you have money, and I think you have because you are reading this article, you should highly consider getting Dell Inspirion 7567. After all, this is the last laptop on this list and I recommend it. Dell Inspirion 7567 is a great budget gaming laptop. The design is very nice, and it doesn’t look like other gaming laptops. It is made of plastic, but it doesn’t feel cheap. It isn’t that light like other ones, but it isn’t heavy also. It weighs 5.7 lbs (2.6 kg). There are a lot of ports, but like HP Omen 15, Dell didn’t include USB Type – C. Instead, you get three USB 3.0 ports, HDMI and internet port, SD card port and of course audio jacks. This laptop was a big disappointment in the beginning, because of the display. It had TN screen which was poor. So don’t buy that one, please. Instead, buy one with IPS display. It is great for gamers, with great viewing angles and good contrast. Not the great option for graphic designers, but it is perfect for gamers. It comes with a full-size keyboard with red lights. It has two levels of backlit, which is interesting. The touchpad is spacious and it is really great. It is fantastic for scrolling and for surfing the web. Inspirion 7567 comes with the 720p camera, which is enough to handle video calls on Skype. The sound is much better than one on Omen 15. Speakers produce quality sound and they can get pretty loud. This is the easiest laptop to open on this list. You can upgrade RAM up to 32 GB. There is also an empty slot for a 2.5-inch drive. Fans will do pretty good job, so laptop won’t get hot even after a hard session of gaming. A big plus for this laptop is the battery. It is 74 Wh battery, and it is pretty powerful. You can surf the internet and watch movies for 8 to 9 hours without even thinking about charging it. But it will be alive for only 1 or 2 hours if you play games. Now, let’s see some specs of this budget laptop. Inspirion 7567 is coming with Intel I5 7300HQ which is pretty decent for gaming. You are also getting Nvidia GeForce GTX 1050 Ti which is around 20% better than normal GTX 1050. You are also getting 8 GB of RAM, which is enough for now, but you should consider upgrading if you do a lot of multitasking like streaming and playing. As I said above, the screen is pretty good if you buy IPS one, but don’t mess with TN one. It is really bad. You are getting 1 TB of space for storage like games and movies, but consider buying SSD for speeding up this laptop. With 1050 Ti, you will be able to pull high on most of the games with great FPS, but for games like Battlefield 1, you will get around 60 FPS, which is still nice. 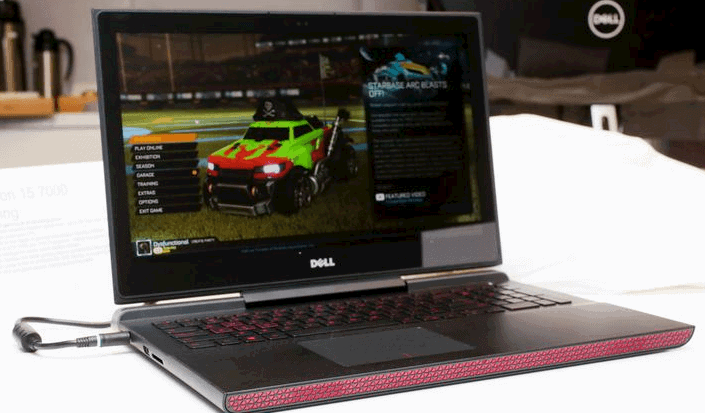 This is a new model from Dell, and I really love it because you will be able to rock 1080p gaming for many years, but the real question is - is it the best gaming laptop under $1000 or not? This is a hard one. And I will tell you why. Every laptop on this list is on the mid-range side. So none is perfect, so you need to figure out what do you need from a laptop. Do you want better speakers or better battery? Screen or GPU? And only then, based on what you need, choose a laptop. Don’t get me wrong, $1000 isn’t small amount of money, but they can’t be perfect. And, whatever you buy, please buy one with 1050 Ti. It is 20-25% better than normal 1050. I will tell you right now if you have money and you can spend a little more than $1000, buy Acer Predator Helios 300. It is the best on this list, so if you have funds, buy it. It comes with the best GPU, 1060. It also has a great screen, the best out of all on this list. And design, it is perfect. 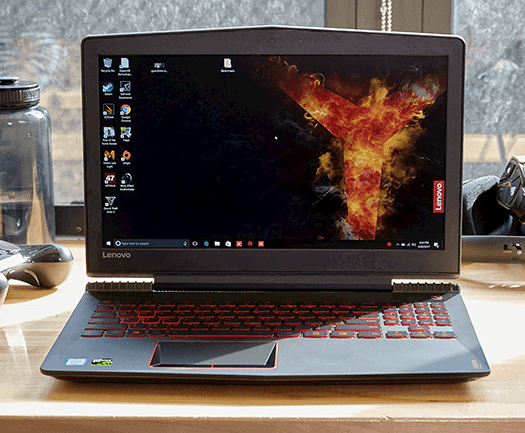 If you are more on the budget side, the best choice is Lenovo Legion Y520. They start around $800, and you can always upgrade them. It is the best-looking laptop on this list, and it doesn’t even look like a gaming laptop. It also has the best audio and best keyboard. That is very important if you plan to game hard on it. So if you have a limited budget, choose Lenovo. Now, if you are a video editor or something like that, the best choice is HP Omen 15. But don’t get me wrong, it is the best choice only if you buy one with a 4K display. Only then you get the perfect balance of gaming and editing. It doesn’t have the best audio, but you can always pop up headphones. The design is decent, and there is a lot of room for upgrade. Also, it will never get too hot so you can’t use it. If you love to play games and you don’t edit, definitely go with Acer VX 15. 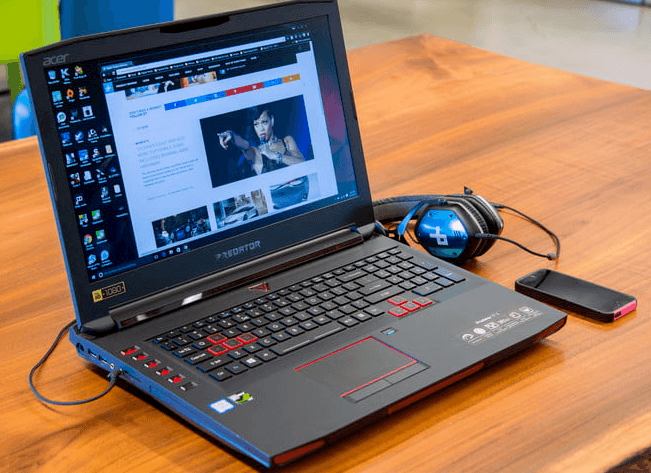 It is a great looking laptop with great performances in gaming, and it isn’t as expensive as Helios 300. The screen isn’t the best for editors, but as I said, if you want to play games only, it is perfect for you. It is like a little brother of Predator series laptop. It has a great keyboard and decent battery life. And of course, there is Dell Inspirion 7567. I really hated it because of that poor TN display, but Dell realized that they made a big mistake so they put IPS display on the market. It is great for gaming and I can say that it is relevant to Acer VX 15. You won’t make mistake if you buy it because it is a really good laptop for this amount of money. It has a clean and elegant design, and audio on it is great. It has the best battery life, so if you need it for long flights, or you just hate power charger, stick with this laptop. 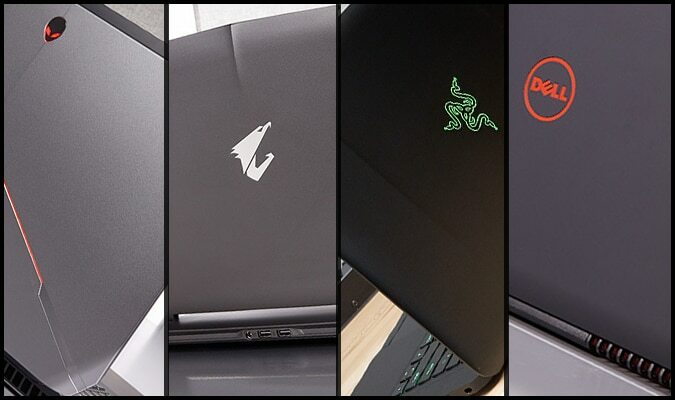 As I mentioned before in the text, if you have more than $1000 in your pocket, you can check out our guide for gaming laptops under $1500 here! This was one big text and I hope you liked it. I also hope that I helped you to choose your future gaming laptop. And I need to say to you, that you won’t make mistake if you buy any of these. They are all great and they all have their Pros / Cons. As I said above, my favorite is Acer Predator Helios 300. If you have money, buy it and you will be safe for next 3 years. But, what is the best gaming laptop under $1000 for you? Let me know in the comments. Also, let me know if I forgot some great gaming laptop and I will add it to the list.